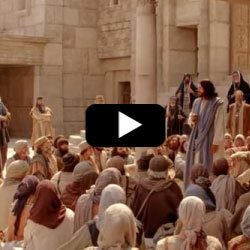 A Pharisee in this video of Jesus, approached the Savior and asked Him a question. Usually the Pharisees tried to catch Jesus in His words so they could later condemn Him. However, this time, this Pharisee was sincere. He asked Jesus, “Which is the first commandment” (Mark 12:28). In the book of Matthew, it is recorded as, “which is the great commandment in the law”? (Matthew 22:36) Jesus answered and said, “thou shalt love the Lord thy God with all thy heart, and with all thy soul, and with all thy mind, and with all thy strength: this is the first commandment. And the second is like, namely this, Thou shalt love thy neighbour as thyself. There is none other commandment greater than these” (Mark 12:30-31). When Jesus says we should love the Lord thy God with all of our heart, what does He mean? Jesus gave one meaning when He said, “If ye love me, keep my commandments” (John 14:15). So, if we keep the commandments of God, we are showing God and Jesus that we love them. Many people think that the commandments are restrictions that make it so we don’t have any fun. That couldn’t be farther from the truth as seen in the example of the kite string. Kite string is like the commandments. The kite string seems to keep a kite from going higher - it’s restricting the kite. However, the kite string is also keeping the kite up in the air. If we cut the kite string, the kite comes crashing down to the ground. The same happens to us when we wilfully disobey the commandments of God, we come crashing down spiritually and we experience depression and feel darkness in our lives. So, the commandments that seem to restrict us, actually keep us afloat and bring us happiness. Let us love the Lord our God with all our hearts, keep His commandments, serve Him and show loves to others. We should always keep in remembrance that the first commandment is to love the Lord our God. We should remember and love God first. Then, the second commandment, we should love our neighbor as ourselves. What does this mean? It means that we should help our neighbor when they are in need. We should mourn with those who mourn and comfort those who stand in need of comfort (Mosiah 18:9). Loving our neighbor could also mean helping those in need and doing acts of kindness for others. Let us remember to love God and our neighbor as ourselves.